What the Plus! - Guy Kawasaki comes to #DadChat | #Dadchat | A Dad's Point Of View | www. #DadChat continued to celebrate its 1-year anniversary with very special co-host Guy Kawasaki, on May 17 from 6:00 – 7:00 p.m. PST. We discussed his new book, What the Plus! plus much more! Read the transcript as you missed the BIGGEST #DadChat ever and one of the biggest Tweet Chats, period with over 2000 tweets, over 400 participants, over a 3 million reach, and OVER 80,000,000 impressions! #DadChat is the chat for anyone who was a child or is a parent. Moms, Dad, Aunts, Uncles, or your dogs and cats are all welcome. We have a great community and I invite you to join us! 1987 was the last time I wrote a book about a product (The Macintosh Way). After using Google+ for a few months, I felt the need to write another product-oriented book. 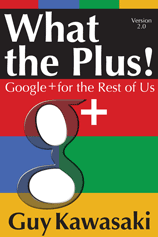 This book explains “what the plus” makes Google+ as special as Macintosh. My goals are to help you to derive as much joy and value from Google+ as I do. My topics include: How to circle people, how to perfect your profile, how to craft effective posts, how to comment, how to respond to comments, and how to share photographs. This entry was posted in #DadChat and tagged A Dad's Point-of-View, apple, Bruce Sallan, Dad Blog, Enchantment, Guy Kawasaki, Moms, Parenting Tips, Social Media, tips for dads, Tips for Moms, What the Plus by Bruce Sallan. Bookmark the permalink.